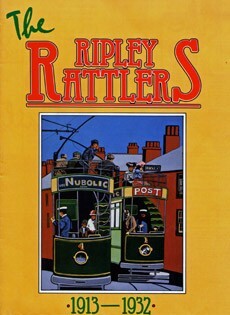 The line ran from Ripley Market Place to Codnor, Loscoe, Heanor, Langley Mill, Eastwood, Kimberley, Cinderhill, Basford and then on to the terminus at Upper Parliament Street in Nottingham. The original Notts & Derbys Tramways Compay Bill of 1902 was an ambitious application which proposed the building of 79 miles of track to link together the tramway systems of Nottingham, Derby and Ilkeston. However, when passed the following year the Act only authorized the construction of 39 miles of route, of which eventually only some 11 miles were laid, being the section from Ripley to Cinderhill, at which point it connected with the tracks of the Nottingham Corporation Tramway. Construction started in February 1913 and all along the route buildings were demolished, trees felled, streams diverted, bridges reinforced and gardens destroyed in order to give the tramway its legally demanded width for a gauge of 4ft 8.5 in. The whole route consisted of a single track with 316 passing loops all on the same side so that the journey from Nottingham was a succession of swings and loops as the cars rattled along. 24 tramcars were built by the United Electric Car Company of Preston, Lancashire and sent to the depot at Langley Mill for finishing. The first batch of cars were open-topped with seating for 24 passengers on the upper-deck and 32 below. The other cars had covered tops and an open balcony at each end. The workforce wore military style uniforms of blue serge and peaked caps with the embroidered script 'inspector' or the white metal badge of 'Motorman' or 'Conductor'. Trousers were narrow with turn-ups; three-quarter-length tunics had high-necked collars. Drivers' wore double breasted tunics with metal buttons. Conductors wore single-breasted tunics with box pleated pockets. Conductors were equipped with a cross-strapped leather compartmented money pouch and bell punch, chained whistle in top pocket, metal ticket rack and indelible pencil. I bad weather the crew wore black oilskins with a reinforced shoulder cape. The first tramcar services started on 4 July 1913, only 5 months after line laying had begun. This was between Loscoe and Kimberley, and the section to Cinderhill was opened a month later. 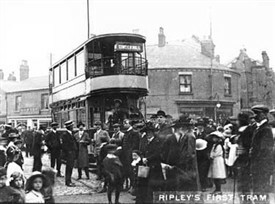 The completed line from Cinderhill to Ripley opened on 1 Jan 1914 which made it possible to travel from Nottingham to Ripley, a distance of 15 miles, in 1 hr 40 minutes. The trams ran for 18 hours a day, except for Sunday when the service was reduced. Fares were a penny a mile. Workmen boarding before 8 am were able to obtain return tickets at single prices, while colliers journeying to and from the pits were charged a penny regardless of the length of the journey. 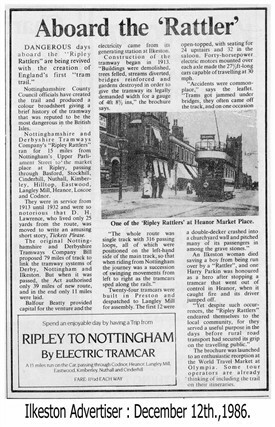 The first trams left the depot at 4.30 am, while the last tram, 'The Flyer', left Nottingham at 11pm with limited stops only. During the 1920's the tram service suffered from competition by motor-buses which could offer a faster, flexible service over more direct routes. However, the Notts & Derbys Tramways developed its own associated company, The Midland General Omnibus Company, which ran in conjunction with the tramway. By 1928 the Company was granted power to operate a trolley-bus system and the first vehicles were introduced in 1932, by which time the old tramcars had fallen into decline. Finally, on 5 Oct 32, the last passenger carrying tram rattled along their rails to its depot at Langley Mill, signalling the end of an era. This page was added by John Parker on 21/08/2013.